It is time to thank those who served in Vietnam. Donate $50 to honor Vietnam veterans and become part of the legacy of the National Archives' Remembering Vietnam initiative. 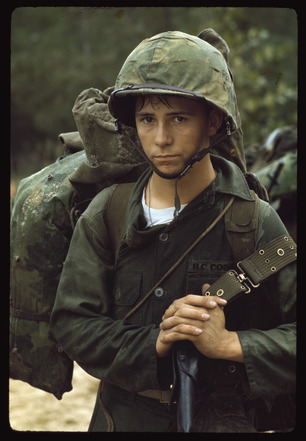 In conjunction with the National Archives' Remembering Vietnam initiative, the National Archives Foundation is raising $50,000 to extend the impact and reach of the initiative through contributions from private citizens in honor of those who served in Vietnam. Names of those who donate $50 or more, or the names of those whom they are honoring, will be displayed in the Remembering Vietnam exhibition in Washington, DC, and online. Donations will support Remembering Vietnam's exhibitions, public programming, and educational outreach, as well as access to military records at the National Archives through preservation, digitization, and more. The National Archives is the nation’s recordkeeper. With more than 13 billion records dating back to the Oaths of Allegiance that General George Washington and his troops signed at Valley Forge, military records from all service branches are the most accessed records at the National Archives. The holdings include military service records, personnel records, and pension records, accessible by veterans and their families. In addition, there are millions of records from each branch that are open to the public, including celebrities' draft cards, D-Day documentation, Secretaries of Defense files, cartographic records, command files, POW/MIA records, hundreds of thousands of photographs, and miles of films and newsreels, among many other notable documents. The National Archives Foundation is a proud Commemorative Partner of the Vietnam War Commemoration. To learn more about the Commemoration, please visit www.vietnamwar50.com. The National Archives Foundation is not a part of, or endorsed by, the Department of Defense. During the Vietnam War, more than 9 million Americans served in the military, but when those veterans returned home, many with physical and emotional scars, they were treated as outcasts. Vilified, spat on, and embarrassed, they did not receive a hero’s welcome nor did they have the medical services and network of nonprofits that support today’s troops returning from a combat zone. 50 years later, the National Archives is honoring those who served in Vietnam with the Remembering Vietnam initiative, telling the story of the war and its legacy with a major exhibit in Washington, DC; a two-year traveling exhibit; public programs and document exhibits across the country; honor flights for Vietnam veterans; education materials for students of all ages; and special events for veterans, military families, and the public. These quiet heroes who we slogged through jungles with, fought side by side with, were wounded with, and sometimes helplessly watched die, always considered themselves just ordinary people. But they were far from ordinary. Let us resolve today that there will be one essential difference: that we will never again allow our veterans and their families to be left alone, left to feel somehow outside, left to fend for themselves.